Tim Hullett reviews the chassis drop process with “students” from Mickey Recon Centers. Mickey Truck Bodies christened the new freestanding training center at its High Point, NC manufacturing complex by holding a 3-day Chassis Drop Qualification course for 22 “student employees” from all four of the company’s regional Reconditioning & Service Centers as well as its main manufacturing facility. 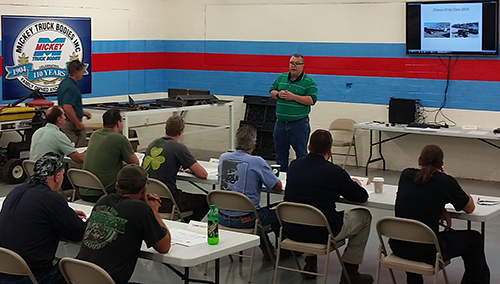 The course curriculum focused on the safety, production and engineering aspects of the Chassis Drop process using a combination of class room lectures and discussions and hands-on demonstrations. At the end of the course participants were required to achieve a minimum test score of 90% in order to receive their official certification. The Mickey instructors were Tim Hullett, Quality Control Manager; Ron McBryde, Chassis Shop Manager; and Josh Soto, Safety Manager. Noel DiBona, VP Engineering & R&D; and John Pierce, Beverage, Van & EV Engineering Manager presented to the class on the importance of the chassis drop, reviewing the drop drawing and understanding the required work. “After 3 days, these employees were able to fill out the chassis worksheet; operate the proper equipment; disassemble a chassis in preparation for the drop; understand the proper welding process; and understand the proper re-assembly process,” says Tim.